West Delhi is said to be the hub of amazing food joints .Every Street and corner is famous for one or the other food speciality of its own. 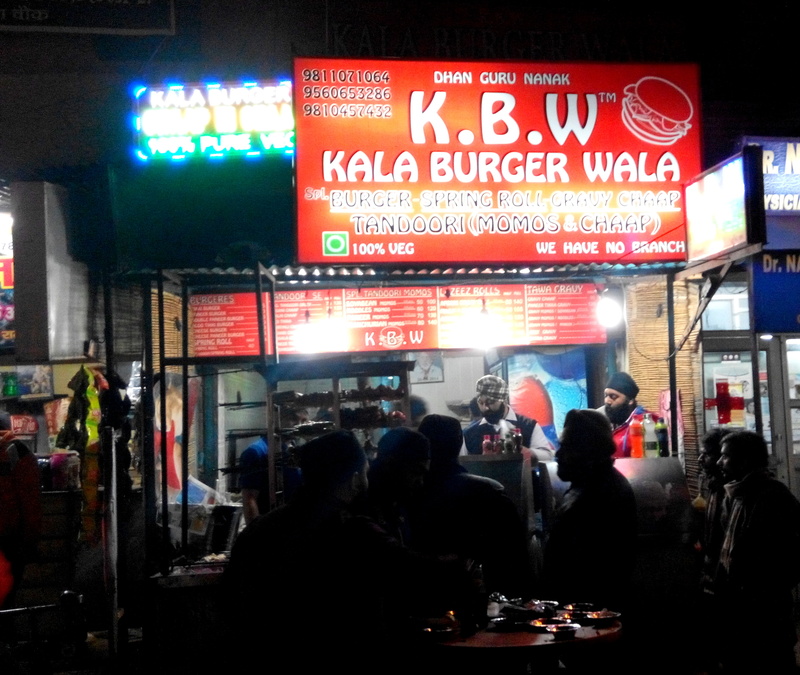 One such fantastic street joint situated in Subhash Nagar is Kala Burger Wala. People who lives around this area has amazing memories attached to this place. KBW was started by Joginder Singh, a small vegetable seller back in 1990 who sold burger at Re 1. Since then it has become the most well known joint in the locality. As the name suggest KBW is famous for its vegetarian burger. Priced at Rs.40, the burger served here is simple yet finger licking. As we all know, usually burger is prepared with fancy dressing and toppings but KBW likes to keep its burger authentic, rich ,tummy filling. The round buns are fried on tawa untill crisp, a sizzling aloo tikki is stuffed in along with big slices of fresh paneer. Thinly sliced cucumber and onion is placed inside the bun and drizzled with generous amount of masala. Guess what ? your snack is ready to digg in. The moment you take the first bite, the soft paneer and aloo tikki dissolves in your mouth. The taste of veggies refreshes you and you actually forget about the calories ! The sour green chutney prepared with anardana ,mint, green chillies and coriander is mixed with sweetness of red saunth and is served along with this snack which is Singh’s wife’s own recipe. Entire joint is run by the team work of the family. One can see the family members rolling the doughs of tikkis and handling the kitchen and counters. With time and stiff competition , KBW added vegetable rolls, spring roll, momos and noodles to its menu .But frankly , customers rarely order these dishes from the menu. The Tikki Burger is what people are fond of. Thus, a great value for money, however, you may find parking problem but suits best as a takeaway joint. Definitely ,a great option for vegetarians that stumps you on your very first visit.